You need one of these pomegranate, kale and coconut smoothies in your life asap! All the great ingredients jammed in there will help keep you healthy and sniffle free. Plus it tastes so delicious the little ones will drink it up without a word. I am the first to admit that I was very late to the smoothie bandwagon. Don’t get me wrong, I tried early on in my clean eating days, but somehow my smoothies always ended up a terrible looking brown colour, and I just couldn’t get around that. I could not for the life of me, drink the brown and enjoy it….so I gave up for a while. I persevered though, and here we are. I have become a bit of a smoothie buff over the years and would love to pass on my newfound knowledge to you to help you get the best out of your smoothie making adventures. If you have a high-speed blender, a great substitute for nut milk is 1/4 cup of raw nuts and 1 to 2 cups of water. If you have a regular blender, a tablespoon of nut butter per cup of water works as well. This is the blender I have and have been using for years. I have tried pretty much every other blender over the years and in my opinion this one is hands down the best. This smoothie is so good that even though my kids watched me put in a handful of kale green stuff into the blender and they still drank the whole thing up and asked for more. The colour itself is AH-mazing. Vibrant green – oh so pretty. 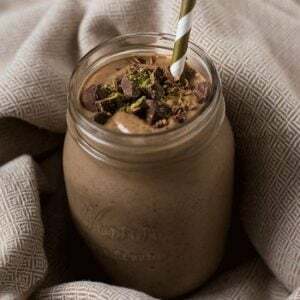 If you really can’t get past the idea of a green smoothie, then you should pop over and check out my Energizing Chocolate Matcha Smoothie instead. We still add in some goodies like avocado and matcha powder, but with the addition of the cacao, banana and dates you won’t even notice the green. 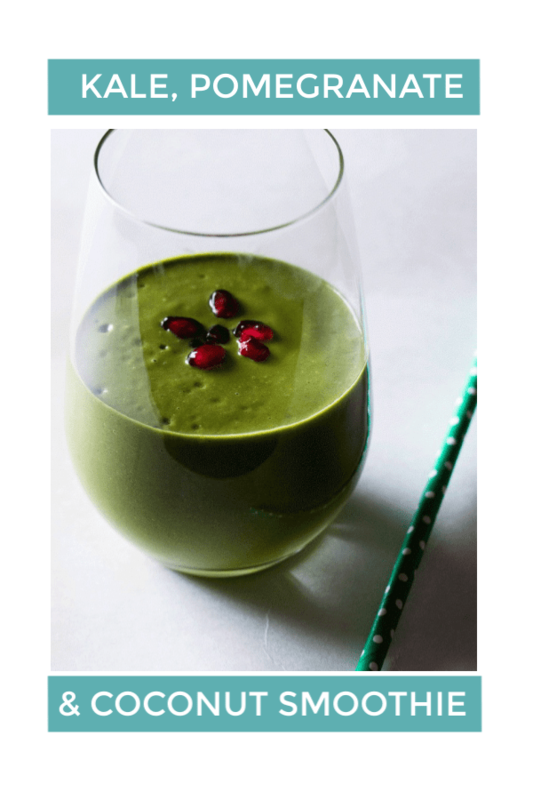 Jam packed with superfoods, this smoothie will pull you through the holiday season feeling your best. It is so delicious, it will convert even those 'no green food' people out there! I’m normally notna smoothie person but this one looks like I would love it I definitely must try. Looks great. I’m loving pomegranates and kale right now. What a great idea to throw them both into a smoothie! You got a 3 year old to ask for more, that’s shows how good it must be. Haha definitely Sara!! She even wanted one as her birthday breakfast! Ooooo this smoothie sounds pretty tasty. I’m obsessed with anything kale, then add coconut, yum! Great recipe. Any idea what I could swap the frozen banana for? Hmmmm It kind of needs the banana for creaminess and flavour, but you can’t taste the banana if that’s what you are afraid of? I have had reasonable success using frozen figs, but it becomes a LOT sweeter, so I would cut down on the amount of dates! This looks really delicious. I like smoothies with kale, but never thought abut adding pomegranates or coconut. I bet this is a great recipe! It is 🙂 I love coconut in anything, and pomegranates at this time of year are just amazing!! I love smoothies and that looks delicious. I hope I can find the pomegranate fruit here. Yeah, if it’s not in season where you are it can be hard to find – there’s usually some lurking around in the frozen section of healthy food stores though! Wow, now that is a smoothie I can drink every morning! Love how bright it is and all the fresh ingredients. This seriously sounds delish! Thanks Jessica, the colour was seriously intense! You had me at pomegranate. I love those little seeds! This looks like a bright, cheery drink. yum. Haha thanks Jenna, it definitely lends itself to a bright and cheery morning! I am not a kale lover but I do like pomnegrate and coconut. What can I add instead of kale? I am going to try this. I make smoothies almost every morning for breakfast and this sounds like a great way to start the day! Yum! This sounds delicious! We are firmly in the brown/purple camp here 🙂 My kids love kale/banana/blueberries/strawberries. Berries seem to be a favorite of the kids, so I do whatever they like! I will definitely have to try this one though. Me too Claire, my favourite way to start the day! You had me a pomegranate! This just sounds absolutely divine! Yum! This looks so delicious! I love green smoothies, but I usually just make mine with spinach. I will have to try your kale recipe! I really need to invest in a vitamix! This looks awesome!! I need more green smoothies in my life!! Thanks for sharing this recipe! Thanks for stopping by Roxanne. This is a great one to get started on, if you aren’t that into green smoothies, it is pretty sweet and not too vegetabley flavoured 🙂 Plus there is coconut – and that makes everything super delicious! Fun recipe! looks delicious. The mixture of sweet fruit and coconut water would take the bitter edge off the kale! I have a smoothie for breakfast almost every morning. They are the perfect wake me up. I definitely will be adding this recipe to my arsenal. I totally agree Blythe! I have slowly replaced my morning coffee with a smoothie, and they work wonders for me!